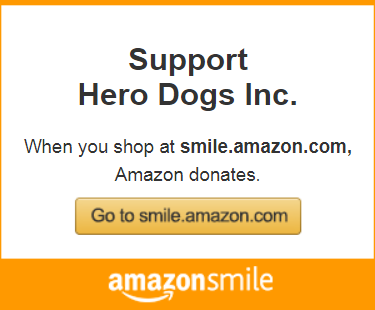 Hero Dogs is an active participant in local area workplace giving campaigns, making over 50 visits annually to federal and state offices in MD, VA, and DC. We rely heavily on the generosity of federal and state employees each year. If you would like to have Hero Dogs visit your office during your pledge period, please ask your keyworker to invite us! If you are not a federal or state employee but your employer has a matching gift program, please remember to apply for the matching gift when you make your contribution to Hero Dogs. Our EIN is 27-0887317. Some employers need the charity to sign and return an application or affidavit; please forward it to us at hero@hero-dogs.org or P.O. Box 64, Brookeville, MD 20833-0064. Similarly, if your employer has a payroll deduction or other workplace giving program, please ask your employer to include Hero Dogs in their charity list. If your employer would like Hero Dogs to come to your offices to make a presentation, please let us know. We’ll plan to bring a service dog-in-training for employees to meet.